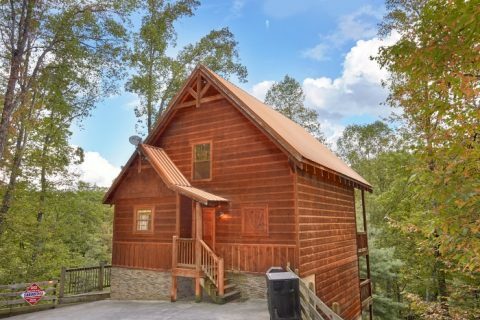 Welcome to "Fort Knoxx," a lovely, 3-bedroom cabin rental in Sky Harbor Resort only minutes away from Gatlinburg, TN! 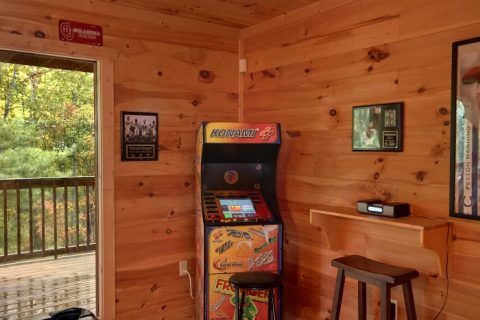 Along with premium amenities, you'll enjoy this cabin's peaceful location that keeps you close to all the sights and attractions you want to see. Whether you plan on hiking in the Great Smoky Mountains National Park, strolling Gatlinburg's Downtown, or riding thrilling coasters at Dollywood in Pigeon Forge, this cabin is central to all of these sights and more! 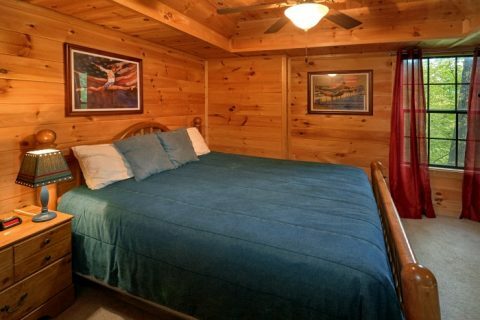 Better yet, you and your family will be glad that you reserved a comfortable cabin to make the most of your stay. 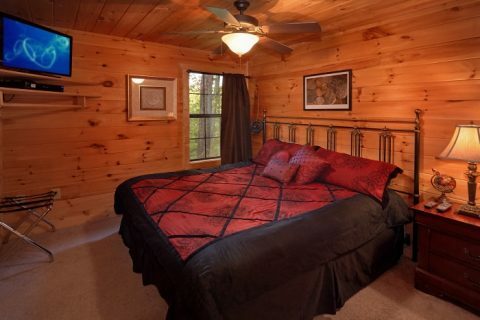 With 3 king-sized bedrooms, your rental can comfortably sleep up to 8 guests. In the main living area, you'll find plenty of space to spend quality time with the people who matter most. 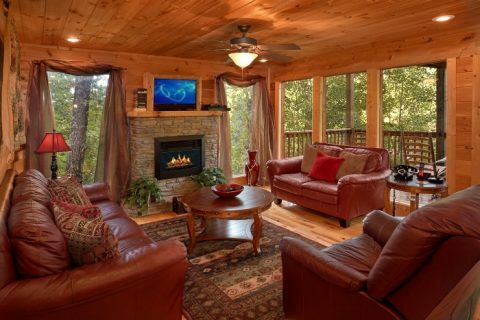 Leather furnishings, a flat-screen television, and an electric fireplace make this room a cozy setting to relax in. 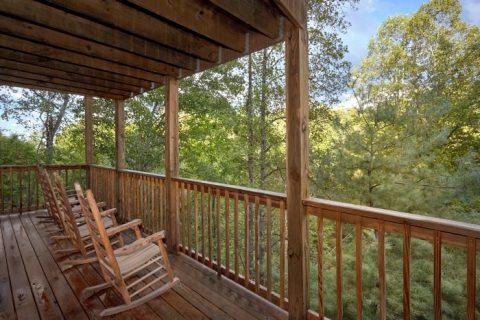 This level of the cabin also has access to the main deck with rocking chairs – an excellent place to sit back and enjoy the sights and sounds of the Smoky Mountains. 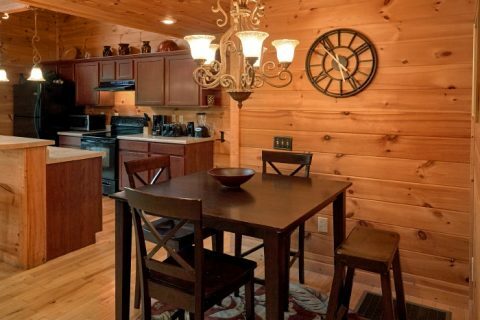 Your cabin's full kitchen is a convenient feature that gives you the option of enjoying tasty and cost-effective dinners at home. 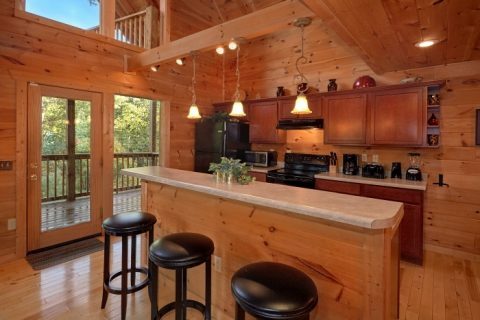 At the same time, you'll have your pick of great local restaurants to try in both Pigeon Forge and Gatlinburg. A BBQ grill also gives you the option of grilling up some delicious burgers and hot dogs during your stay. 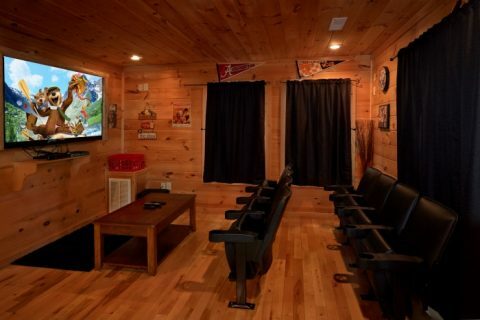 For experiencing great cabin entertainment, take a trip downstairs to the game room and theater room. 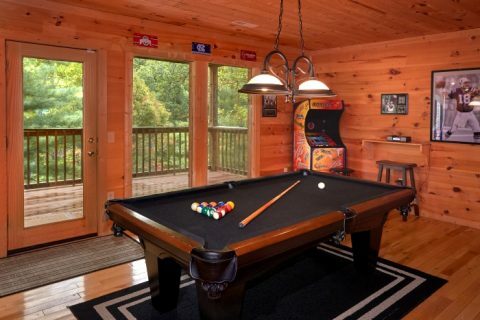 Here, you'll find a pool table, stereo, stand up arcade game and a home theater complete with theater-style seats and a 65" HD television. 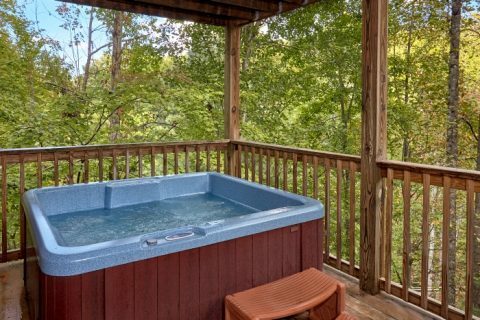 From here, you can step out onto your rental's lower deck that boasts a hot tub and more space to relax in the great outdoors. 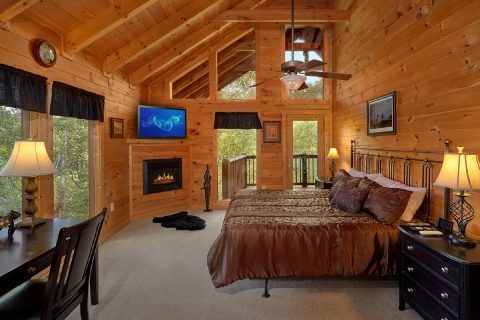 Each of this cabin's 3 king-size bedrooms features private televisions for relaxing in the evening. As an added perk, a luxurious master bedroom on the main level boasts a full bath, a sleek desk, access to a private balcony, and large picture windows to let in plenty of natural light. 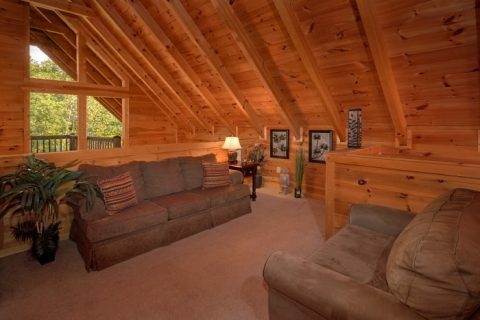 In the upstairs loft, a twin sleeper sofa and another sleeper sofa are provided to accommodate extra guests. 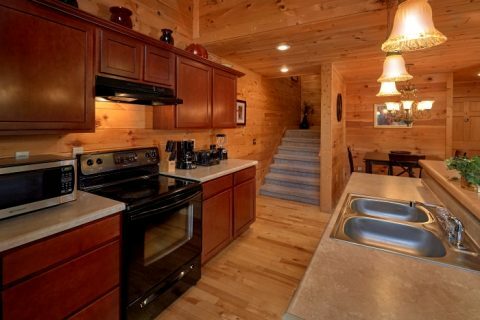 Reserve "Fort Knoxx" for your Smoky Mountain cabin vacation in Sky Harbor! 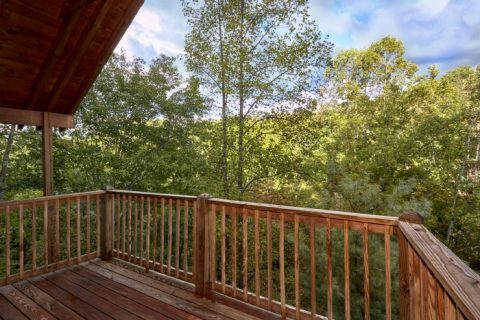 This lovely cabin in the mountains above Pigeon Forge and Gatlinburg is just what you need for a vacation that's relaxing, fun, and truly affordable.